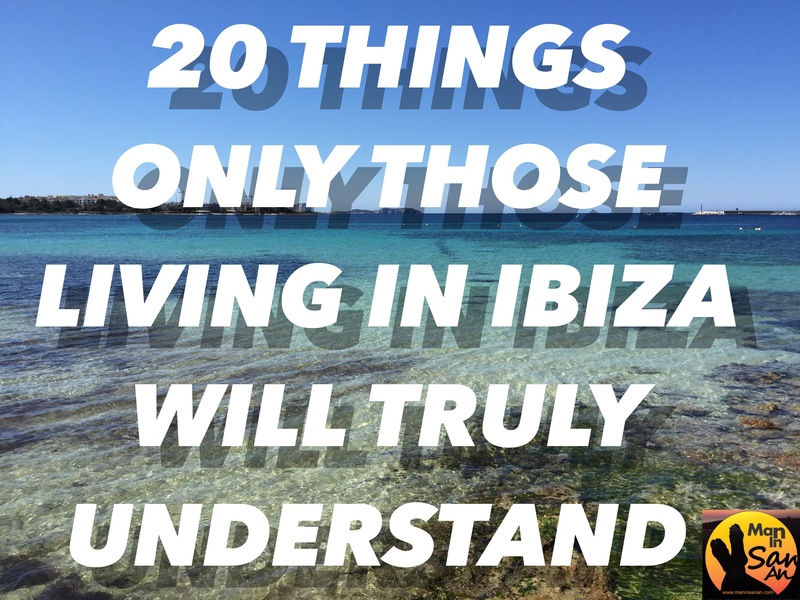 Living in Ibiza is never straightforward and always interesting with a big learning curve. Here’s a lighthearted look at how life is on the white isle. 1. If you’re under the age of 30 all your friends back home presume you’re a drug dealer. If you are over 30 they presume you’re mad. 2. You start getting a taste for hierbas especially with ice and can’t understand when visitors say it’s horrible. 3. Most of your friends and family want to visit in August and automatically think you are also on holiday. How wrong they are. 5. When you suggest to your friends that they visit in winter they look at you blankly. 6. You invariably rent your apartment or house from a family with one of the following surnames: Bonet, Costa, Cardona, Escandell, Marí, Planells, Roig, Riera, Tur, Torres or Ribas. 7. You become addicted to olives, bread and aioli without even realising it. 8. A long lunch in Ibiza is at least 4 hours and can sometimes go into the next day. 9. You point blank refuse to pay to get into a club, you live on the island after all. 10. If you are over 40 then Ibiza Rocks/Pikes and Children of the 80s is obligatory. 11. You can’t help yourself but you start to sneer at tourists especially those wearing stereotypical clothing. 12. You laugh at people that post a thousand photos on Facebook and profess their love for Ibiza then do exactly the same when you visit Formentera. 13. You spend the whole of winter wishing it was summer then the whole of summer wishing it was winter. 14. They say that we are all connected by no more than six degrees of separation but in Ibiza its usually 2 or 3 at most. 15. Be prepared to talk about food to your neighbours and Spanish friends, it’s the common denominator. 16. Take every bit of documentation to every meeting on every occasion and still be prepared to get annoyed. 17. Allow at least 4 weeks when ordering anything from a local shop, 6 weeks over Easter and Christmas. 18. You’d never dream of walking up D’alt Vila but during the Medieval Festival you find yourself there in crowded streets in the unbearable heat. 19. Animal lovers are everywhere so don’t say anything controversial even in jest and especially not on social media. 20. You have to come to terms with the fact that in Ibiza nothing really makes much sense but that’s all part of the fun. Originally published in April 2016 as my 100th blog post, thanks for reading! Why do they think we should all be tanned,they don’t realise we work 6/7 days a week in the summer and don’t have time to lie on the beech all day..
Yeah, man, that gut Wayne looks like really weird. People call him Zebra Man. Do not tell him because he might get upset. Congratulations on your 10th blog post! And thanks for all your posts. BTW in this post number 12😊, I’m so GUILTY!!! Love this, but I’m only a wannabe living in Ibiza. Hubby and I will be there soon, end of April for 3 weeks, can’t wait. I blame it all on Napoleon. You forgot, every second person will either heal you or heighten your spiritual consciousness or both.